commented on "Love Velvet! 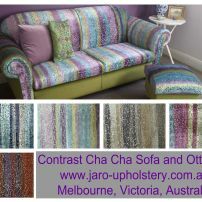 This Sofa and Ottoman covered in Cha Cha Velvet." Love Velvet! This Sofa and Ottoman covered in Cha Cha Velvet. Velvet is so so very popular now! We have a large selection of velvets from crushed to fine or patterned in a huge selection of gorgeous colours. Click on picture for further information.